I drew this when I was 11 and rediscovered it while looking through my ancient portfolio. Long ago it was printed on the cover of this newsletter in black and white even though my original was in color marker. As practice with Affinity Photo, I chose to recolor my old illustration, but all I had was the printed copy on the left. The colorful original was never returned and I think you'll agree the black & white reproduction is muddy and lacks contrast. 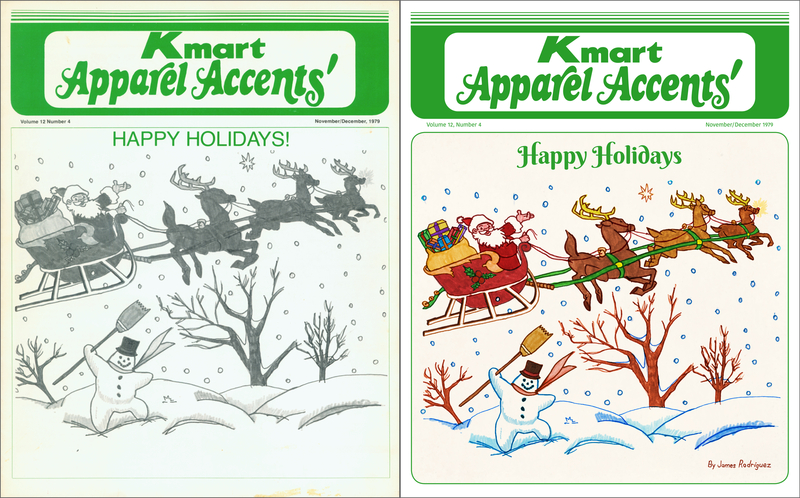 I scanned the reproduction and AP helped bring color back to my childhood drawing. My main goal—aside from returning color to a cherished memory—was to keep the integrity of the marker work. Under no circumstance did I want to clean up or improve what is otherwise a child's drawing. I'm happy to say Affinity Photo handled this personal project flawlessly. The file is over 300 layers, and each hue is isolated and colorized using Recolor Adjustments and further manipulated with Brightness/Contrast Adjustments, and of course Masks. Before recoloring, I painted out the gray fills to isolate & retain the strokes. Separate layers of the original B&W fills were then used for colorization. The Paint Brush tool and its options helped me get the job done. 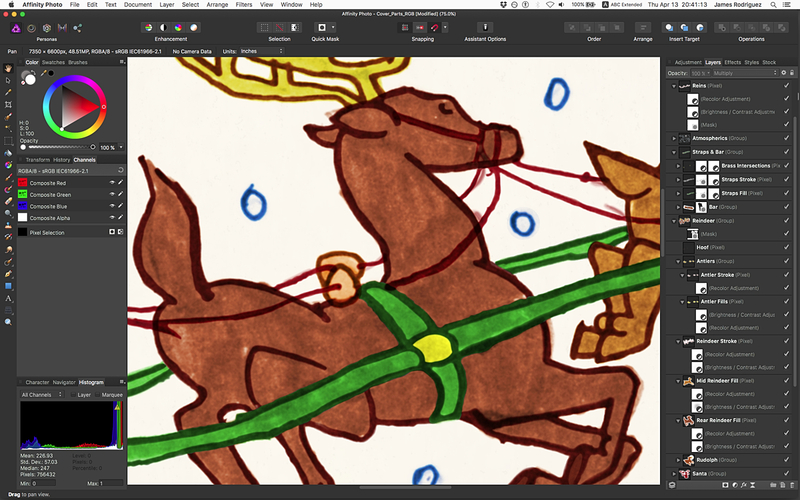 My old childhood drawing has color again, thank you Affinity Photo. Nice job James! I just checked out the Behance link and left a comment. Wow what a ton of work, but it turned out great! Cool idea too. Thank you, Retrograde, I'm honored a fellow cartoonist approves! It was a lot of work, many long nights when I'd rather re-watch Babylon 5. But seriously, I really wanted to see this project to the end, and AP is awesome. I'm anxious to see it evolve although it handled this 300+ layer file without much complaint. Maybe some of that is due to my laptop: a late 2011 17" MacBook Pro with 16GB Ram. Oh my god, I just realized Retrograde is Kevin, they're both the same person!! Holy crap. Thanks for the comment over at Behance, I'm flattered. I was checking out your Squirrel earlier and trying to figure out how you did the blends on the coat. Tee hee... yeah, that's me. Regarding the blends, they are just a mixture of shapes, gradients, etc with different degrees of blurs and transparency tool gradients applied to build up highlights or shadows and usually a fair amount of inner shadows on the edges of the shapes as well. I used to airbrush a bit years ago and I try to emulate some of that style of shading now in Designer. If you check out the paths screenshot of the squirrel you'll see a lot of shapes and even some single blurred paths in there used for shading and highlighting. Sometimes I go into pixel persona and actually paint the shadows/highlights but not on the Squirrel piece. It's all vector. Anyway, this is your thread so enough about me. I liked some of your modo work on that Crown Royal bottle, crazy details. I never tried that kind of vector approach in Illustrator and at some point I really oughta give it a go in Designer. I always brought vectors into Photoshop for softening and blend work, and I imagine I'll continue that trend with AP, but I must expand my toolset. I'm tentatively considering a second version of the Crown Royal bottle (a larger size) to learn different modeling techniques with Modo, and about a year ago I started work on the new label. Again for practice, I used a trial version of Affinity Designer for all the hand lettering. My intent was to fully complete the label with Designer, but the trial ran out, I waited for a sale which never came, and though AD is VERY affordable I was forced to finish the label with Illustrator & Photoshop. But I regretted not buying Designer. I needed the practice of that complicated label to determine if AD could handle all the subtle gradients of the curtains and pillow and background. And just the general workflow of AD—I wanted to see a complicated project through with it. I might've used your vector approach to blends, and I wanted to give Pixel Persona a try. To your point about crazy details, that's why I chose Crown Royal. The cap alone is a modeling challenge, but combined with the bottle itself and the detailed label I knew pulling it off would be impressive and a terrific learning experience. This is the only portion of the new label I completed with Designer. Wow, that Modo thread is kind of insane. Crazy stuff James. For your first post it's pretty advanced stuff. I do a bit of 3d work myself so I have some idea of what's involved and let me say I'm impressed sir! Thank you, Kevin. What 3D program do you use? Price or lack of price I should say was a factor as well of course but the best part is the lightning fast development, great community and the fact that it's open source and constantly being improved daily. A lot of people gripe about it's steep learning curve but as a (ahem) 50 something, I didn't find it too bad. There are so many tuts out there it really isn't that much of a big deal to get up to speed with it. It works for my needs. LightWave is the only other serious 3D package I used (Ray Dream Studio was used for my Battlestar Galactica Viper image on Behance). I'd like to learn zBrush, C4D and Blender. My Kmart Christmas project was assembled with InDesign, but I'm excited for Affinity Publisher. How much longer do we have to wait? 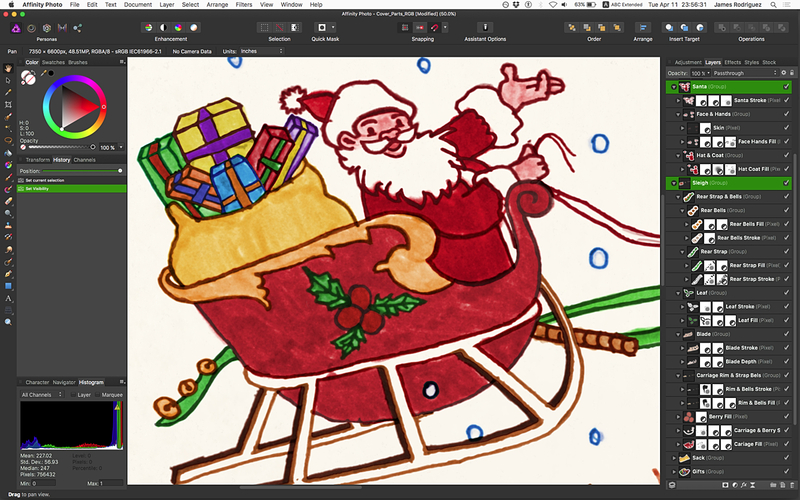 This screen shot shows Santa in his sleigh. Separating marker outlines from fills took quite a lot of layers, and all outlines got separated from the fills. If a fill was a different color, it got a different layer. Then everything was further segregated into element groups, for my own sanity. I have just been onto your Behance website and all I can say is wow! 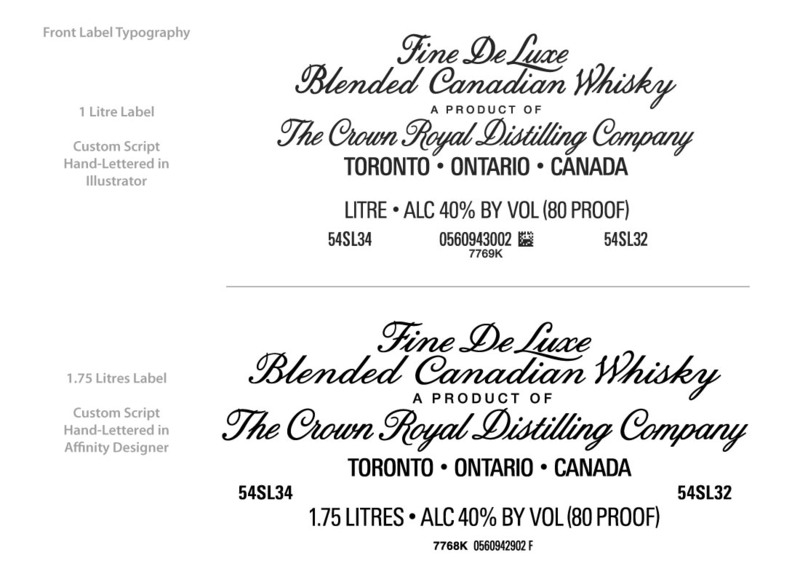 It was a lot of work, everything was created from scratch, including the label and script typography. As this was a personal project there was NO client supplied anything. I'm super glad you liked it and thanks for the kind word, friend. I'm still stuck on your first sentence "I drew this when I was 11..."
If you didn't told this was a recolouring project I would never guess it started as greyscale copy. It's really well done and looks absolutely genuine. Thanks as well for the link to Behance describing the whole project. It's nice to have a glimpse at all the work involved here as it's not always clear what's needed to achieve such a great result. Thanks for posting/sharing. With as much time as this project took, I'm feeling more justified with every favorable response. For a while there I was second guessing the value of colorizing a childhood illustration. I mean, who would care? Also, my enthusiasm waned because I used only a handful of AP tools/techniques. The labor was mostly Brush tool usage—to eliminate, not create. Pretty tedious. 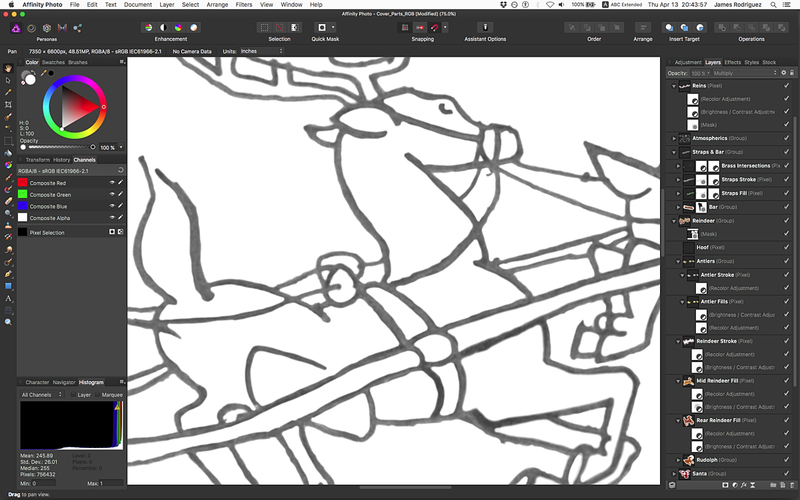 Here's more detail of one of the reindeer and its 3 phases.